As its competitors up their compact-car game, Kia isn't sitting still. The 2017 Kia Forte sedan and Forte5 hatchback both hit the showroom floor with notable updates to styling, powertrain and technology. The upgrades add to an already impressive list of features that includes three different body styles and excellent refinement and quality. New England drivers - this car is amazing on icy roads. 2017 Kia Forte; stick shift - six gears. Shifting through the gears is very forgiving and the car is easy to drive – but it is slow to get going. This car gets great mileage, I average 40 mpg. This varies between 36 mpg on very hilly terrain, or for winter driving with 4 studded snows and warm-up idling (I live in Vermont) – to 43 mpg on the flat areas of the highways. Standard transmission gives me the option to use the engine for speed control on steep and/or icy roads. This car is amazing on icy roads. Driver's seat adjusts up and down, and it has an adjustable steering wheel. Back seating is roomy enough for adult long legs. The trunk is big enough for 3 tires! Caveat for snowy area – the car sits low, the tires are only 15” and I have become bogged down by just 5 inches of snow. Also snow becomes packed in the wheel wells and you have to clean that out before it freezes. I do wish it had a rear window wiper. Overall I really like the car and I would buy another. Small car with not a lot of storage space but gets great gas mileage! The vehicle is very small. I took the "trunk cover" off the back of the vehicle so it added a little more room and I could put more in the trunk area. I cannot put a large purchase of groceries in the back. I have to use the back seats and front seat as well if I want to purchase a lot of groceries. Besides being very small, the tires squeal every single time I go around a curve. It does not matter how slow or fast I go, they squeal regardless and it is very embarrassing. I have checked tire pressure and tread and all is fine. I am not sure why they do that. I have only owned the car a year and it already needs new windshield wipers. I am not sure how often they are supposed to be replaced but one year seems like a short amount of time. The last thing I do not like about this vehicle is when I need to get into traffic quickly, it does not accelerate quickly enough. A personally interesting detail that I quite like is the Bluetooth. From my first car to my most recent car, I have always driven under the brand Kia. They're reliable, have smooth driving, great gas mileage and they're on the more affordable side of the price ranges. Also a Kia's reliability is that much more than any other car, because I have never had a severe issue with either of mine, they were simple and easy to fix problems. Like a flat-tire, or tire pressure. Kia also has Bluetooth enabled in most of the new versions of their cars, which allows hands-free calling and Bluetooth music connection. 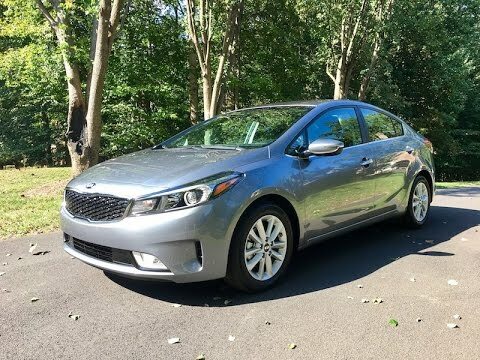 The Kia Forte is a compact mid-size car, so its not too small they you feel overpowered by other cars on the road, but it is not too big they you have to be cautious about parking and fitting into small spaces.